2.Reading of order to commission the U.S.S. Steinaker. By direction of the commandant, U.S. Navy Yard, New York. (a) The National Ensign is hoisted and saluted. (b) The commission pennant and Union Jack are hoisted at the mainmast and jackstaff respectively. 4. Assumption of Command by the Commanding Officer, Commander S.A. McCornock, Jr., U.S.Navy. 6. Hoisting the personal flag of Rear Admiral F.A. Daubin, U.S. Navy. (a)Rear Admiral F.A. Daubin, U.S.Navy, Commandant, U.S. Navy Yard, New York. The U.S.S. Steinaker is named in honor of the late Private First Class Donald Baur Steinaker, United States Marine Corps Reserve. Quantico, Virginia, and was attached to the First Marine Division in the field until he was killed in action on 9 October 1942. 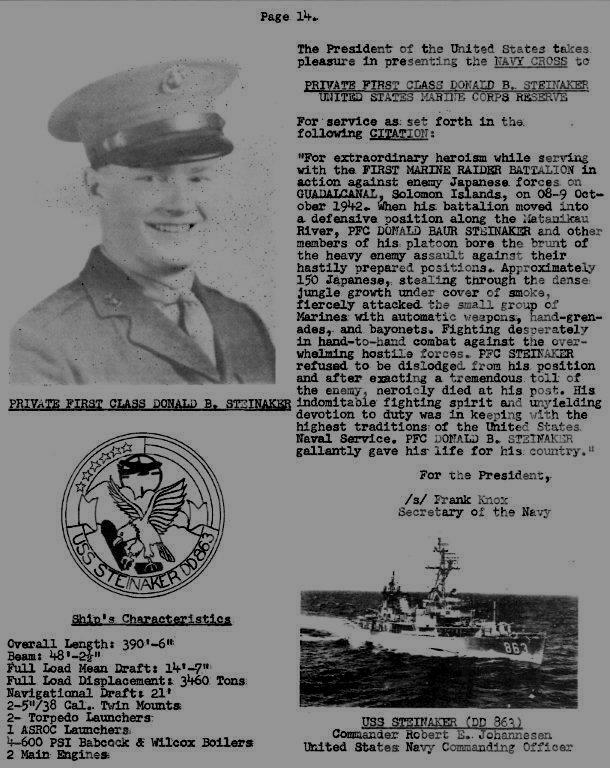 Private Steinaker was awarded the American Defense Service Medal---1941, the Asiatic-Pacific Campaign Medal---1941, the Purple Heart---1942, the Presidential Unit Citation---1942 and the Navy Cross. “For extraordinary heroism while serving with a Marine Battalion in action against enemy Japanese forces on Guadalcanal, Solomon Islands, on October 8-9, 1942.When his battalion moved into a defensive position along the Natanikau River, Private First Class Donald Baur Steinaker and other members of his platoon bore the brunt of the heavy enemy assault against their hastily prepared positions.Approximately 150 Japanese, stealing through the dense jungle growth under cover of smoke, fiercely attacked the small group of marines with automatic weapons, hand grenades, and bayonets.Fighting desperately in hand-to-hand combat against the overwhelming hostile forces, Private First Class Steinaker refused to be dislodged from his position and after exacting a tremendous toll of the enemy, heroically died at his post.His indomitable fighting spirit and unyielding devotion to duty was in keeping with the highest traditions of the United States Naval Service.Private First Class Steinaker gallantly gave his life for his country. The U.S.S. Steinaker has the distinction to be sponsored by Miss Carol Steinaker, sister of the late Private First Class Donald Baur Steinaker. All guests are cordially invited to attend a buffet luncheon aboard ship immediately following the commissioning ceremonies. Guest of the sponsors and officers will be served in the Wardroom country; guests of Chief Petty Officers will be served in the Chief Petty Officers’ quarters; guests of other members of the crew will be served in the forward crew’s compartment. The ship will be open for inspection from after commissioning to 2:00 P.M. Bus transportation will be continuously available for guests between the Washington Avenue Gate and the ship. *the above information was obtained from a copy of the program handed out at the commissioning ceremony. This picture submitted by Donald Steinaker, nephew of Donald Steinaker, July 2011. 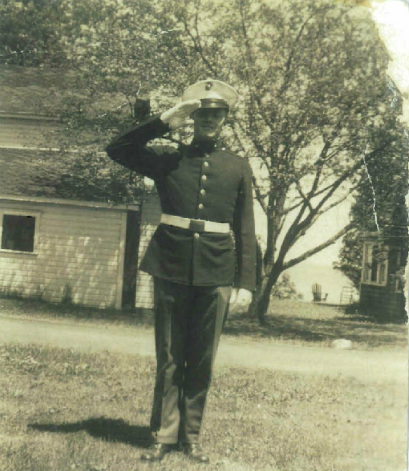 The scene is of his Uncle Donald with the family cottage near South Bay, NY on Oneida Lake in the background and most likely it was taken by his grandmother in either the summer of 1941 or 1942.
weapons and detection epuipment. This capability, combined with modern radar and five inch gun mounts, rendered STEINAKER as one of the most versatile ships in the United States Fleet. Prior to conversion, STEINAKER was attached to Destroyer Squadron TWENTY-SIX , for which she served as Flagship in 1959, 1961, and 1962. In 1962 she was awarded the Destroyer Squadron TWENTY-SIX Battle Efficiency "E". Upon completion of the FRAM I conversion, STEINAKER joined Destroyer Squadron TWO in Norfolk on 24 April 1965 and a monthy later celebrated her 20th anniversary during refresher training at Guantanamo Bay, Cuba. months in the RED Sea and Indian Ocean as a unit of the Middle East Force. STEINAKER had shown the American Flag in ports from Northern Europe to India. The Cold War period saw STEINAKER participate in a myriad of operations. In July and August 1958, STEINAKER operated with the SIXTH Fleet in support of the U.S. Marine landings in Lebanon. She was attached to the Project Mercury Space Program during April 1961 for a training mission and was called upon to participate in the Cuban Crisis Quarantine in October and November of 1962. In October and November of 1967, STEINAKER participated in a classified operation under the operational control of Commander Submarine Force, U.S. Atlantic Fleet. A three week training cruise in early 1968 was used to sharpen STEINAKER's operational capability prior to her March Pacific deployment. mile journey to the south China Sea. The action she would see while operating off the coast of Viet Nam would be the first combat seen by this destroyer since her commissioning in 1945.
minimized enemy troop build-up and concentration. Her accurate fire power was continually provided to forces ashore and was used without hesitation in the close support of friendly troops. On 1 November 1969, STEINAKER became a unit of Destroyer Squadron 22, homeported in Norfolk, Virginia. From January to July of 1970, STEINAKER participated in a deployment to the North Atlantic area, the initial stages of which were spent as the United States representative in the Standing Naval Force, Atlantic and multinational NATO destyroyer squadron. Sea cruise in April with three other ships of Destroyer Squadron 22. STEINAKER returned to Norfolk on 23 July 1971 for leave and upkeep and assignment to operations in the Western Atlantic. It was transferred to the Naval Reserve Force. Netzahualcoyotl. The Netzahualcoyotl (USS Steinaker) is still operational!